I run tubulars and never leave home without it. Have saved me more than once. Definitely recommended. The product works very well , the only issue I have had is the top pops off as you are filling the tire. I ride tubbies and this stuff has gotten me home numerous times. Easier than putting on my spare tire it had worked on some pretty large punctures. I don't even need to use an entire can to seal a puncture. The thing is, it is not cheap but when I am miles from home riding solo I'd pay double to be able to limp home and not have to, on the side of the road, pull off an old tubular and then put the spare on (and still have to limp home). I've used half a dozen of these over the years. They'll seal small holes and get you going quickly without a laborious and time consuming tire change. If you're on regular tubed clinchers, it's too much to spend for the convenience without the assurance of a successful seal-maybe in a race. Have a plan B-a spare tub and a regular inflator in case the sealant fails. Good product for punctures and cuts less than 1 mm (As it claims?). Works better on round punctures compare to cuts. Cuts 2mm or more than 2 mm there is less chance. It will seal 2 mm cut first but when you pump the tire the clot can't hold up after 60-70 PSI on road tire. The clot will pop out followed by squirting whatever you injected in. It is designed for 2 tires but You may end up injecting 70-80% of the can on one tire. Will you reply on 20% left over for next use? You will need to use your Co2 on top of Vittoria sealant because the pressure is not high enough. If you like tubies this is your savior. 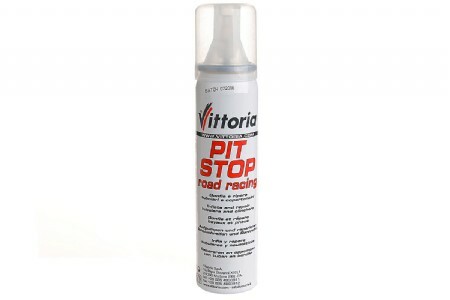 Can't live home without Vittoria pit stop if you like tubular tires, works very well and easy to use pump your tire right away without losing to much time and less to carry don't need spare. Downside if you have a blowout or huge cut it will not seal it. I run tubulars on my road bike...why? Because I build road bike from old CX bike parts. It works great. Buy a couple at a time. You may even consider trying it out at home before needing to use it on the road. I rode to work today, noticing that there was a lot of glass on various parts of the road. Got to work fine at 8am. At noon, I checked the bike and saw that my rear tire was flat. Brought out the Pit Stop, rotated the valve to 12 o'clock and gave it a shot. Fixed it instantly! Topped it off with a litte CO2. Now in the next four hours, I can make sure it holds before riding home. A little pricy, but compared to replacing a tubular tire...worth every penny. Running Vittoria Pave Evo CG tubulars on CX tubular wheels. Beautiful ride! Didn't work for me. Had a flat in a Gran Fondo and went through two cans of this stuff. Didn't appear to be a huge cut in the tire. Disappointing. Riding tubulars without Vittoria sealant is asking for a ride home in the back of a truck. Carrying an extra tire is a pain when a small canister usually will do the trick. I ride Cont. Competition tubulars and when needed this stuff works. Works well on small punctures. A must have for Tubulars! Riding tubular tires should be experienced by every cyclist at least once. I love riding my tubies, thus carrying this sealant is a must! Yes, it is a little expensive, but unlike other products IT WORKS, and that's nothing compared to your $100 tubular tire, which is rendered useless, unless you can seal that puncture, especially 60 miles away from home. Yes, you can carry a spare pre-glued tubular in your pocket, but who wants to go through the trouble of removing and mounting a new one in the middle of nowhere. Just make sure that you remove the puncture debris prior to using it. We ride tough tubulars on racing bikes as West Texas is tough for flats. Although the pit stop may need to sit a day or two it usually seals spot punctures, saving purchase of a sewup. Our rims are 95mm so this is the only possible fix. I have heard people routinely start with this in sewups for prevention. Directions are simple- start with stem up top then be sure to rotate at intervals and dont leave stem at bottom for awhile. Get more air in soon. Save your coin. What is ironic it doesn't work on Vittoria's own tires!